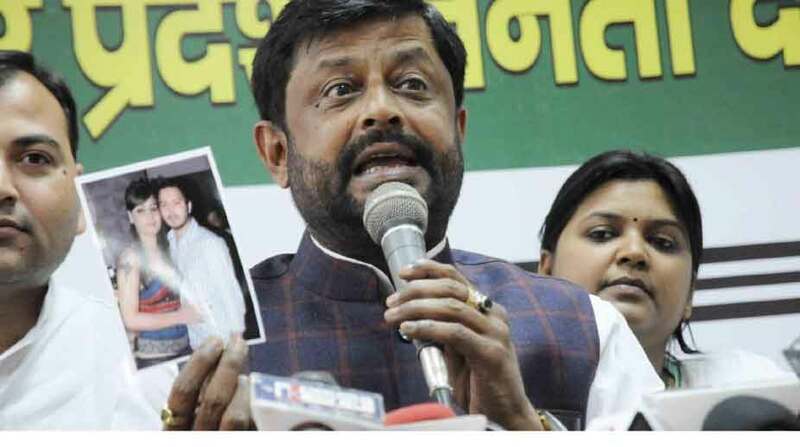 The war of words triggered between JD-U and RJD over a selfie of a hooch tragedy accused with Chief Minister Nitish Kumar continued on Friday as well, with the Janata Dal-United leaders releasing Tejashwi Yadav’s photograph with a young woman. The development comes a day after Leader of Opposition Tejashwi Yadav attacked Nitish Kumar and questioned accused Rakesh Singh’s “easy access” to the Chief Minister’s official residence here. Four JD-U spokespersons on Friday held a press conference and alleged that Tejashwi Yadav, younger son of Rashtriya Janata Dal chief Lalu Prasad and former Deputy Chief Minister, himself consumed liquor. “Lalu Prasad should first take care of his family and home before making allegations against others,” JD-U Spokespersons Sanjay Singh and Neeraj Kumar said. Tejashwi Yadav on Thursday challenged Nitish Kumar’s statement that he did not know Rakesh Singh’s background, saying the latter was Block President of JD-U in Bhojpur district and was invited to meet Nitish Kumar when he took a selfie with the Chief Minister. As for Lalu Prasad’s statement that liquor was served at the house of the JD-U leaders at night in dry Bihar, Sanjay Singh offered to get their houses searched but with a caveat that the former Chief Minister should also allow a search at his house. “Truth will then come out in public,” he said. Within hours, Tejashwi Yadav also held a press conference and again targeted Nitish Kumar, saying how two Express trains were named ‘Archana’ and ‘Upasana’ when he was the Railway Minister. “Whether Nitish Kumar has boarded these trains or not, the country know why he named them so. Why did he name the two trains so without permission from the Ministry?” the RJD leader said. As for his photograph with a young woman, he said it was an old one when he was playing the Indian Premier League cricket. “It is normal for a girl to take a selfie with a cricketer. I don’t know her personally. She has pictures with other cricket players or celebrities. That does not mean she is of bad character or that my character is bad,” Tejashwi Yadav said. He said JD-U spokespersons, on instruction from Nitish Kumar, had “lowered the standard of politics”, but the RJD will not follow suit.